Property 2: Superb villa in beautiful gardens close to beach. Property 4: Villa Riina. The best you can get in Sri Lanka ! Private luxury beach villa ! Property 37: Butterfly Villa in “Paradise Island"
Property 49: Anjana Villa is a modern detached three bed roomed villa. Staying at Villa Riina was an unforgettable experience! The owner and in-house staff were all fantastic. They took care of everything including airport transportation, bringing in very affordable nannies, excellent food, and even a massage therapist. It was a completely relaxing and pampered vacation. It&rsquo;s easy to get to both Ambalangoda and Hikkaduwa from the villa. Be aware, the AC is only in the bedrooms. Although there are ceiling fans in the living room and porch, it still gets very hot. A wonderful villa with all the facilities for a brilliant holiday. It is situated off the main road with easy access to the town either by walking or tuk tuk. Udith, the owner and the staff were always friendly, helpful and courteous with nothing too much bother for them. The villa rooms, garden and pool areas were cleaned daily and maintained to a high standard. The surrounding area has lush vegetation and spectacular wildlife, a real treat for early morning walking. Fruit and veg can be bought along the roadside and there are small stores nearby though we chose the larger supermarket in town for our big shop. Though the villa more than lives up to the photo's on the website we dropped a star rating because the third double bedroom, which is downstairs and isn't shown, is only large enough to accommodate the king-size bed and 2 small sets of bedside drawers. The 'dressing' area is outside the bedroom door, is open to the downstairs living area, and includes the bedroom's built in wardrobe which was a constant source of mosquitoes despite being sprayed regularly. 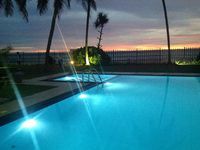 That apart, it is a lovely, spacious and comfortable villa that we will recommend to friends who wish to holiday in Hikkaduwa. Udith organised our airport transfers and a 4 day, 3 night tour around the island with a minibus and English speaking driver which gave a great insight to the Sri Lankan culture. We also took advantage of a local chef he provided to prepare our evening meal one night and it was both educational and delicious. The gas BBQ was a big hit for the other nights we stayed in but mostly we tried various eating establishments out and about. Our favourite, and closest, was the Happy Walk restaurant just 15 minutes walk from the villa towards town.